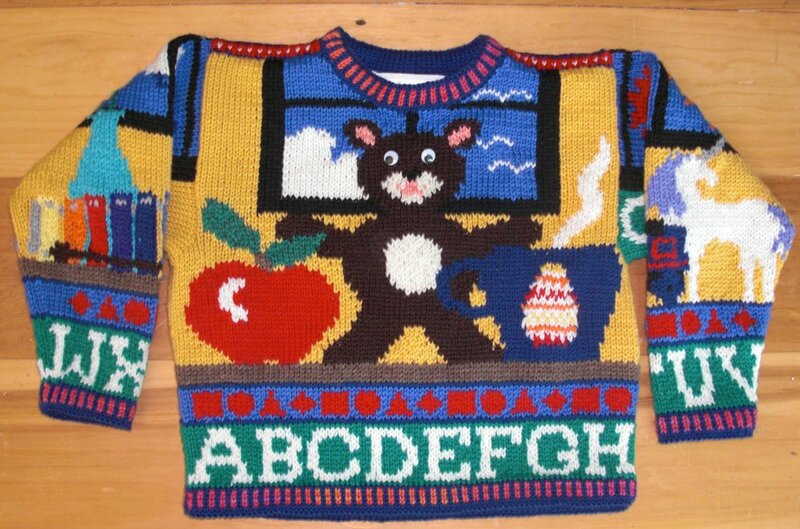 This is another of my favorite sweaters, for the sheer difficulty of it. 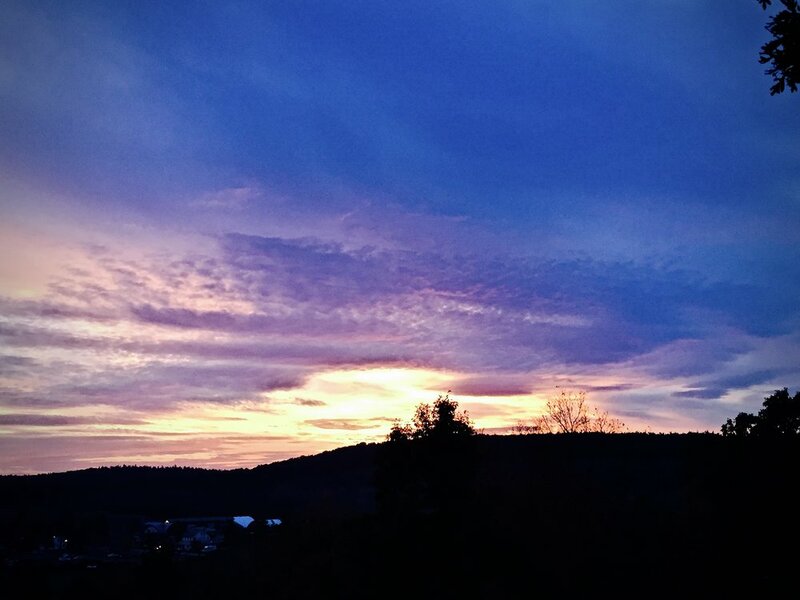 There are so many colors and elements to navigate! I tried to actually represent each letter. The front has apple, bear, cloud, drink, egg, fly(? ), grill, and hot. 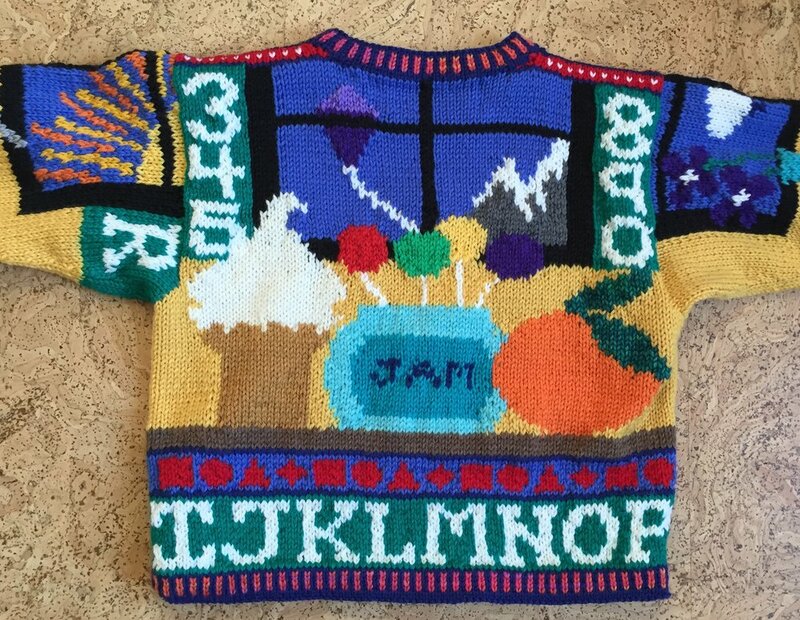 The back has ice cream, jar, kite, lollipop, mountain, numbers, and orange. The left sleeve has peony, Q, R, sun, train, unicorn, and vase. 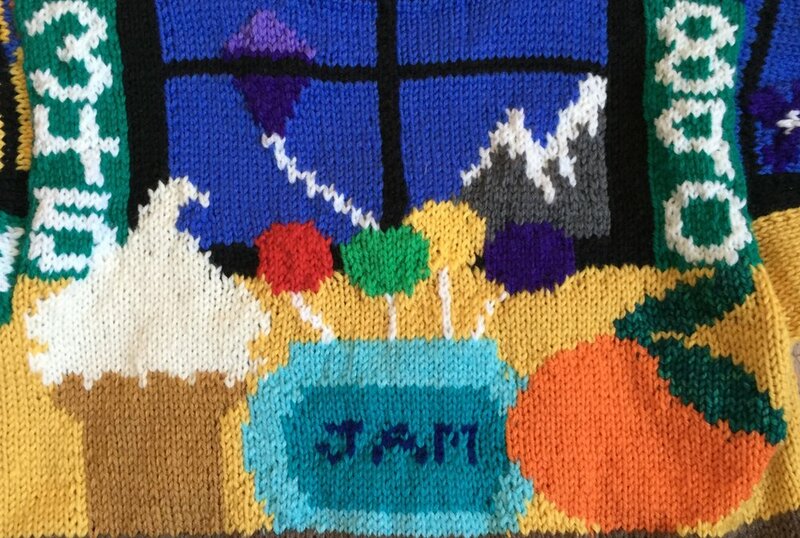 The right sleeve has (violets), window, xylophone, yarn and zeppelin. The actual letters form the hem and wrists trim. There is also a trim of red shapes on blue. The neck, wrists, and hem trim is alternating dark blue and variegated red stripes. 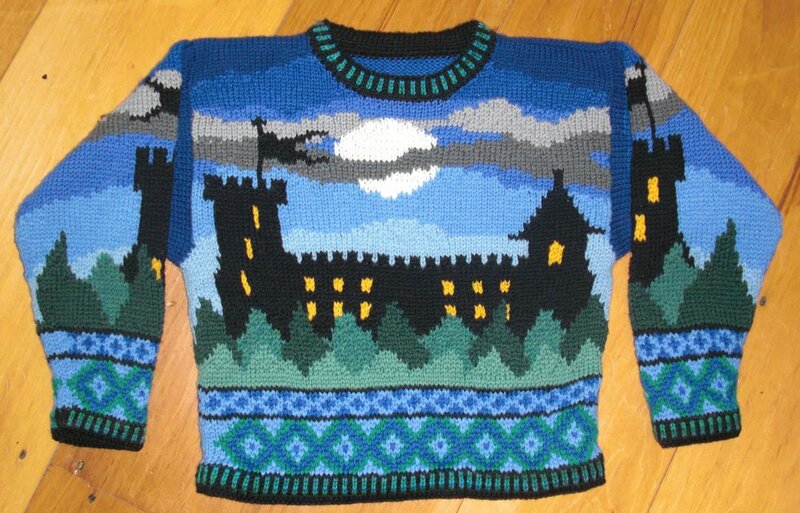 This is a larger version of the Castles One Year sweater. The front and back are identical. The brightly lit castle is in shadow against a full moon and a lightening blue sky. Dark green trees in three shades make up the foreground. The sleeves have one tower as the focus. A simple pattern in greens and blue diamonds circles the hem and wrists. There is also a blue-on-blue diamond trim pattern. The neck, wrists, and hem have an alternating trim pattern of black and variegated green stripes. Until Amaran entered third grade, we lived in Maryland on the Eastern Shore in a wonderful house Leif built for us. The Fourth of July was a big event there, in different ways. In Oxford we saw the fireworks from land, as they burst over water and boats honked their horns with frenzy over each display. Later we watched the fireworks across the water in Cambridge from the little inlet in front of our house. This year in Sarasota we watched from our high-rise as competing towns set off fireworks all at the same time; the flat horizon showed too many, and they lost their effect. But fireworks were magical when our children were young. This sweater shows Fort McHenry during the battle that inspired The Star-Spangled Banner. The neck and armhole openings have a red ribbing, and the hem has a modified ribbing hem. This is a smaller version of Levin's Northern Lights sweater. The penguins and polar bear are smaller and the aurora colors are also simpler. The colors continue on the sleeves. The trim of white crosses shines on variegated blue. The neck, wrists, and hem trim is rainbow stripes. This is inspired by the idea of fairies everywhere, but I don't think it works. On the front are the Sun fairies in varying gold to red clothes under the sun's rays. On the back are the grey Rain fairies holding umbrellas. These same patterns continue on the sleeves. The shoulders have a turquoise trim with sun colored diamonds. The wrists and hem trim is sprays of color against purple shades. There is a wavy lace trim pattern at the hem. This is an adaptation of Levin's Saint George sweater. There are several changes: red cross and white cross trims at the neck and shoulders, red cross shields on dark blue for the wrists and hem trim, and simplified colors on the back especially. Here another tree appears in the background. The soot spirits trim appears and gains a green background. The neck, wrists, and hem trim becomes a picot edge.